The remarkable InLine Collection will transform any living space into a bedroom. Just remove 4 sofa cushions and fold down the stylish InLine Murphy Bed. Customize with hutch options, colors, drawers, doors and bed sizes. Read below for a full description. 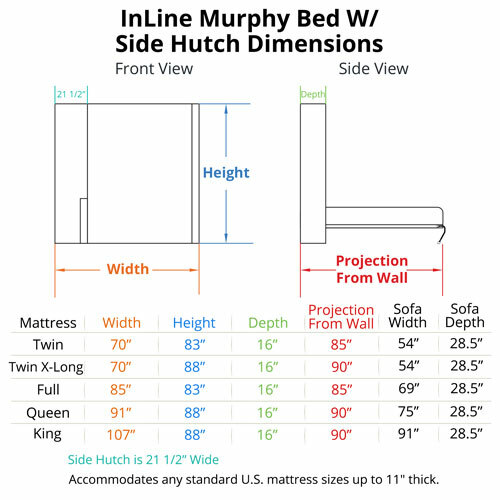 Our InLine Murphy Bed with Hutch and InLine Sofa kit comes complete with all parts and hardware ready-to-assemble and is available in: Twin, Twin X-Long, Full, Queen, King, . White industrial-grade melamine is standard with optional upgrades. Our InLine Collection Murphy Beds come with slab (flat) 3D Laminate panel door faces and the InLine Sofa. The remarkable InLine Collection will transform any living space into a bedroom or hide a guest room in plain sight. This model is compatible with the InLine Coffee Table, sold separately. 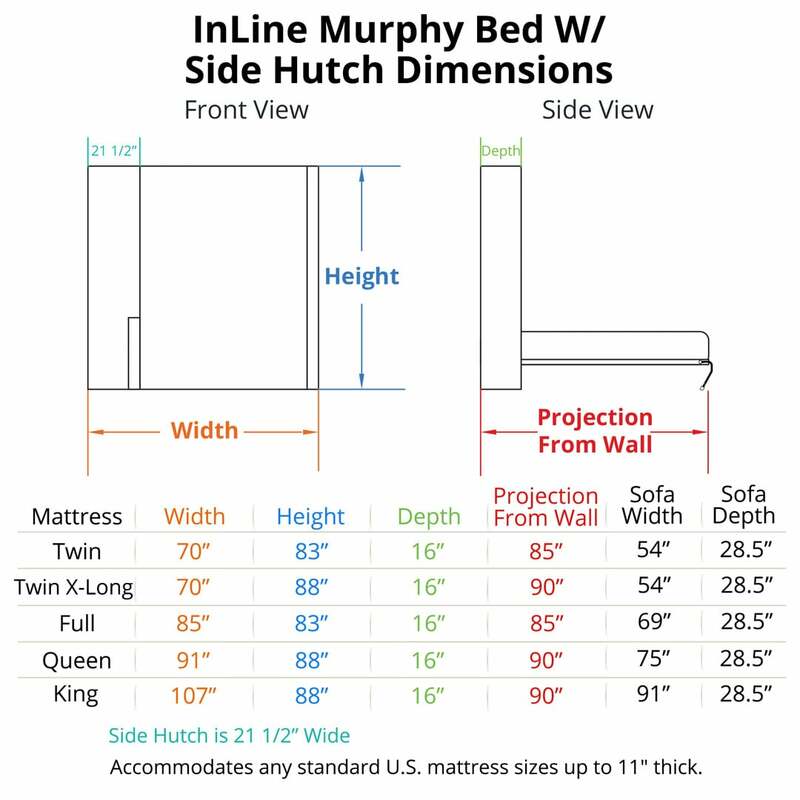 Sit on the InLine murphy bed couch and watch TV by day, then fold down the InLine Murphy Bed and watch TV by night. Just remove 4 sofa cushions and fold down the stylish InLine Murphy Bed. Add to the living room décor with the matching Murphy Bed Chair. Customize with hutch options, colors, drawers, doors, bed sizes and lights. The InLine Sofa is made with comfortable foam cushions and durable fabric. The side column will open to reveal extra storage. Both the side column and the hutch comes with 1 fixed shelf and 3 adjustable shelves. Hutch options: The hutch can be configured with open shelving, doors (with adjustable shelving behind the doors) or drawers with a shelf. The shelf can be used as an end table for the sofa, or as a night shelf when the bed is folded open (click the images to the left to see hutch shelf). View the "Hutch Options" tab above to see a full list of hutch options.